April 7, 2017 by Laurie Leave a Comment This post may contain affiliate links, which means if you click on a link and purchase something, I may earn a small commission (at no additional cost to you.) See my disclosure policy HERE. And now even under my kitchen sink. I have a really (really!) bad habit of stuffing things under the sink (trash bags anyone?) when I'm in a hurry, and I realized today just how bad it was and knew I could do better. 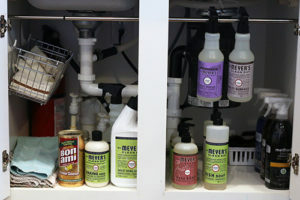 A lot of what was under our sink didn't belong there at all, and I totally fluffed things up. I even tried out the cool curtain rod trick for hanging a few cleaners that everyone's seen on Pinterest, and it worked. And that little basket on the top left of the cabinet? All it was was two Command Hooks and a wire basket from Walmart. and get this one marked off your list. I'd sure love for you to join me this month as we're getting our homes + bodies + minds in order, so be sure to also take a second to snag your free Be Awesome in April printable over HERE. Psssssst! Don't forget that you have a few more days to snag your free gifts from the Grove Collaborative! 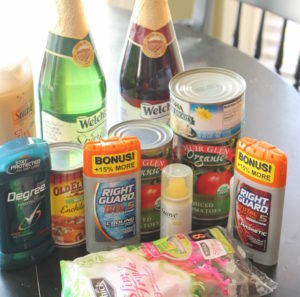 That makes each item just $2.40, SHIPPED TO YOUR DOOR, compared to $4-$7 per item at Target or Amazon. If you're interested in trying out the Grove Collaborative, head on over HERE and snag your free stuff. It's only available for a few days, so hurry while it's available! Think of Grove as Amazon for natural cleaning products, cosmetics, diapers + try out free shipping and see what you think. Looking for more motivation to get started today? Here you go! April 5, 2017 by Laurie Leave a Comment This post may contain affiliate links, which means if you click on a link and purchase something, I may earn a small commission (at no additional cost to you.) See my disclosure policy HERE. 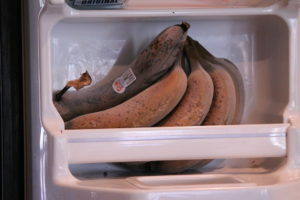 Today I cleaned out my fridge. Armed with a toothpick, a few awesome cleaning supplies, and some serious elbow grease this project is finally all finished. I popped everything back in place (we'll see how the Dollar Tree bins work for corralling a few items?) and my whole kitchen feels soooo much better. And just in case you missed it earlier, the Grove Collaborative has offered PPP readers a special promotion to get FOUR FREE MRS. MEYER'S PRODUCTS DELIVERED TO THEIR DOOR. I promise, we're going to make cleaning FUN, and totally take back control of our homes this month ~ I'm so glad I get to hang out with you! February 2, 2014 by Laurie Leave a Comment This post may contain affiliate links, which means if you click on a link and purchase something, I may earn a small commission (at no additional cost to you.) See my disclosure policy HERE. Despite my good intentions to finish out two more days of our 25 Days to a More Organized You posts, I realized today it's just not going to happen. I've scrubbed and shined and Mr. Cleaned (and vacuumed and dusted and decluttered and ughhhh… ) in hopes of getting our house ready to go on the market soon, so here's just a quick peek at all of our organized closets! Sorry to not keep up as well as I'd planned ~ this is one of those times that life just got in the way, and I appreciate you all understanding. 😉 However, if you have any (any!) 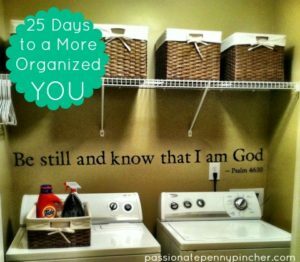 time in your week to work on organizing any rooms your home, I encourage you to get started. I hate that I've waited to move to tackle these chores, but isn't that always the case? Oh well . 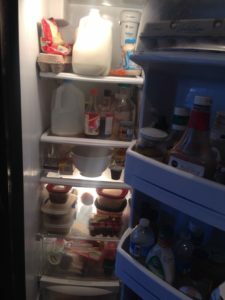 . .
Day Sixteen: What Do You Need In Your Kitchen? 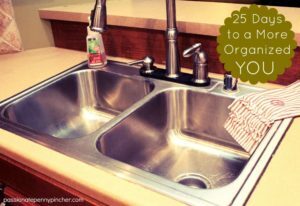 Have you shined your kitchen sink and completed your laundry? If you can't get anything else done over the next few days try to tackle those two! Here are the before and after pictures . . .
January 27, 2014 by Laurie 2 Comments This post may contain affiliate links, which means if you click on a link and purchase something, I may earn a small commission (at no additional cost to you.) See my disclosure policy HERE. This weekend I tackled my 13 year-old's (disastrous!) bedroom. As we're getting ready to put the house on the market, this one clearly needed some attention, but trust me, you are crazy to wait until you have to organize to get projects like this done! We probably worked for about two hours, but afterwards both he and I were so much happier with the room. Why on earth did we wait so long? Here's a peek (I can't believe I show you all this stuff… ack!) Just forgive the iPhone pictures on some of these . . . These pictures are awful from my phone, but I can't get a good lens on my better camera to give you a good view ~ hopefully you get the idea! You can also see how we organized his Nerf guns a few years ago ~ that's made his closet so much better and is well worth the investment of a few laundry baskets! 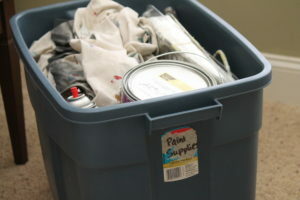 Do you have a room in your home that needs some attention? Determine to schedule a few minutes (ummmm . . . hours?) to tidy it up this week ~ I promise you'll be so glad you did! January 26, 2014 by Laurie Leave a Comment This post may contain affiliate links, which means if you click on a link and purchase something, I may earn a small commission (at no additional cost to you.) See my disclosure policy HERE. 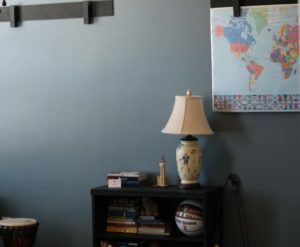 This is a re-post from last year on how we set up our family's command center. I'd love to know how you organize your family's schedule each week! Of all the questions I get here on PPP, probably the biggest one that comes up is how to organize your coupons. I love saving money, adore using coupons, and will be a penny pincher every single day of my life, but organizing coupons is one of those things that stresses me out too. 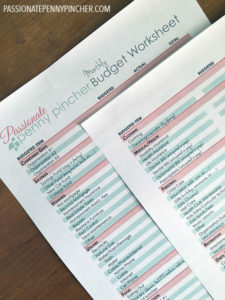 When we teach coupon classes, my friend Shannon and I always share that we've probably tried every method of organizing there is out there, so here are a few different ways for you to get started. Remember though that there is no one “right” way to organize your coupons ~ do what works for you and don't worry about how other folks keep up with their coupons! Here are a few tricks to get you started. . .
And finally, check out this simple way to save just by filing coupon inserts by date. 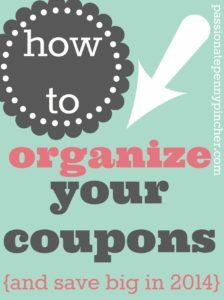 I'd love to know which coupon organizing method you use, and if you've come up with another system I'd sure love to hear about it! January 23, 2014 by Laurie Leave a Comment This post may contain affiliate links, which means if you click on a link and purchase something, I may earn a small commission (at no additional cost to you.) See my disclosure policy HERE. Does anyone else have issues with this one? I have organized it once and then organized it again, but basically I've decided it's one of those things that you've got to do over at least once a year. Here's the before and after. . . So much better! All I used was baskets that I found at the Dollar Tree (for $1 of course!) and it took me about 15 minutes to tidy it up. 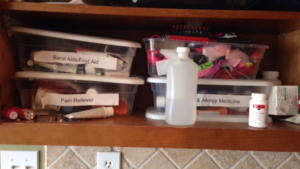 If your medicine cabinet could use some attention, tackle this job in your home today too! January 22, 2014 by Laurie 38 Comments This post may contain affiliate links, which means if you click on a link and purchase something, I may earn a small commission (at no additional cost to you.) See my disclosure policy HERE. Because I've been racing around just cleaning my house today (no time to organize anything!) I thought I'd re-post this and would love to hear your thoughts ~ leave a comment to share! Do you really need fourteen mixing bowls in your kitchen. . . or could you survive with just three? Is it necessary to have 13 wooden spoons, or could just a few do the job? 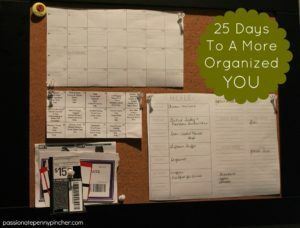 This is one of those questions I find myself constantly asking as muddle through my cupboards, and when a PPP reader asked for a list on the first day of our 25 Days to a More Organized You series, I thought it would be fun to throw together. It's so easy to see another fancy kitchen gadget or cute utensil and think we need it, but eventually those items can take over our kitchen cupboards, and force us to lose all sense of organization. Gadgets can also get pretty pricey, so whenever possible I try to pass them by! But, there are a few items I'd have a tough time living without, and they help cooking each night in our home become so much more manageable. Here's a peek at what's on my must-have kitchen list, but it may look different than yours (especially depending on how frequently you cook, and how many you're feeding!) I'd love to hear your suggestions also . . . but here's a start at what I'd be lost without. . . This is far from a complete list, and I'm betting you have other items you'd absolutely love to have or think are way more than you need! So, what are your must have kitchen products? Leave a comment HERE to share . . . it's always fun to hear your thoughts, and this is a great time to clear out those cupboards of any items you just aren't using! This post does contain affiliate links which helps support this site. See my disclosure policy to learn more. January 21, 2014 by Laurie 4 Comments This post may contain affiliate links, which means if you click on a link and purchase something, I may earn a small commission (at no additional cost to you.) See my disclosure policy HERE. First off, can someone please tell me why on earth we let ourselves live like this? And secondly. . . my husband pointed out to me that I can do this as many times as I like and most likely it'll come right back to a mess again. Ugh. Several items I found in the junk drawer that clearly had no business being there. Double ugh! 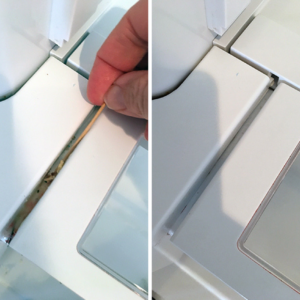 Do you have a “junk” drawer that cold use a little TLC? Take 15 minutes and see what you can accomplish ~ I'm betting you'll surprise yourself with how much you can get done in just a small amount of time, and I promise (promise!) it'll feel so good when you're done. January 20, 2014 by Laurie 4 Comments This post may contain affiliate links, which means if you click on a link and purchase something, I may earn a small commission (at no additional cost to you.) See my disclosure policy HERE. 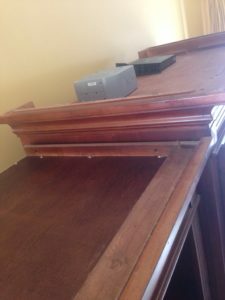 So, I shared with y'all about our upcoming move (yikes!) which of course means I've got a closet or two to clean out. 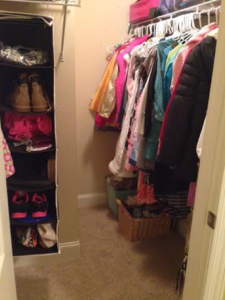 My ten-year-old's closet is the last one that needed a serious cleaning, and I'm so glad to have it done today! Now, the clean closet doesn't look all that impressive, until you see where we were just eight hours ago . . . The only good thing that I know about moving (at least that I can come up with so far . . . ) is that it forces you to do a serious de-cluttering, and I am thankful for that. Take some advice from me ~ don't wait until you're forced into some de-cluttering ~ get ahead and enjoy the fruits of your labor! I really encourage you to tackle a few of the closets in your own home over the next few days if you can. 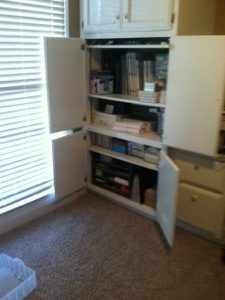 When my husband and I realized a move was coming, we did a major de-cluttering of our own closet, and I can't believe how much more peace I have just having that one closet clean. 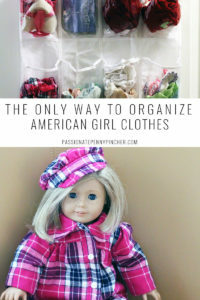 If you struggle with keeping up tidy closets (ahem, or your children struggle with that one . 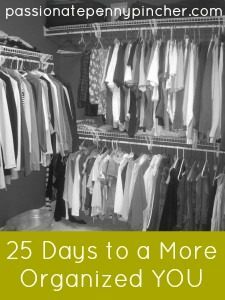 . .) I encourage you to take on the challenge and make 2014 the year to keep those closets just a wee bit more organized. You'll be so glad when it's done! January 17, 2014 by Laurie 4 Comments This post may contain affiliate links, which means if you click on a link and purchase something, I may earn a small commission (at no additional cost to you.) See my disclosure policy HERE. Here's a re-post of my all time favorite way to organize the spice cabinet. I spent about 20 minutes tidying mine up today, and encourage you to spend a few minutes working on yours too if you can this weekend! My spice cabinet has been a mess for months . . . despite several attempts to re-organize. Because I'm such the penny-pincher, I've refused to spend any moo-lah on items that could better organize my spices, which has led to crazy disaster every night as I start to cook! Finally, as I was cooking this week and got knocked in the head by a pie plate (yup, it was that bad), I decided that this was just ridiculous. (Seriously!) You see, we've been married for almost sixteen years, and I've never done anything to make this mess better. . . I've tidied it, but there was just no system in place! So yesterday I ran to Walmart and spend $30 on a few items to Fluff it Up. (Why on earth did I wait so long?) Here are the results . . . Recently, a friend convinced me to purchase a nicer computer and it has made a huge difference in my productivity on PPP in 2012. (I spent my first year blogging on a $300 netbook . . . it was just awful!) I've started to realize that sometimes (when you can afford to! ), spending a little money to purchase items that make you work more efficiently is just worth it. And you can imagine the amount of time that I've spent searching for spices in that mess up top has definitely hurt my productivity! So, while I don't want to spend too much on things I don't need, I do think it's okay to splurge every once in awhile on things that will make me more effective in my work (which is cooking for my family!) Especially since I saved enough money in my grocery budget this week to splurge on it . . . yayyyyy! Find a few minutes over the next few days and see if you can give your spice cabinet a good clean out ~ you never know what you may find while you're there! January 15, 2014 by Laurie 2 Comments This post may contain affiliate links, which means if you click on a link and purchase something, I may earn a small commission (at no additional cost to you.) See my disclosure policy HERE. Now go spend a few minutes working on yours too! January 14, 2014 by Laurie 2 Comments This post may contain affiliate links, which means if you click on a link and purchase something, I may earn a small commission (at no additional cost to you.) See my disclosure policy HERE. I donated a few blankets that we never use to our church's thrift store, put larger flannel sheet sets away in my kids closets, and stacked blankets that my kids could use for “fort-building” at the bottom of the closet so they can easily get them (and put them away!) when they're playing. Goodness, gracious, why do I settle for that mess when I could have something so much better? 30 minutes, a good sized trash bag for items to donate, and a little resolve to get it done. If I can do it, I know you can too! January 13, 2014 by Laurie 3 Comments This post may contain affiliate links, which means if you click on a link and purchase something, I may earn a small commission (at no additional cost to you.) See my disclosure policy HERE. Did anyone manage to tackle their laundry this weekend? We got home last night from Atlanta and it was so nice to know that my laundry was mostly caught up on ~ so I'm determined to stick with this one all month long. While my laundry room for the most part though looks pretty good, the ironing has been just waiting for someone to get to work. So last night while watching some of Downton Abbey (I have to finish the rest tonight), I decided to get this job marked off my list. Here's before . . . I still have five little girl dresses that need to get finished up on tonight, but for the most part these are done and out of my way . . . yay! 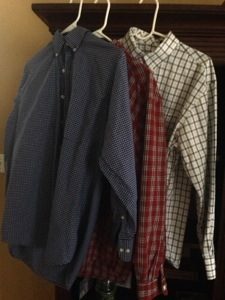 I don't iron many of our clothes, but it's so good to have some of the ones that have been hanging in our laundry room for months finally ironed and put away. 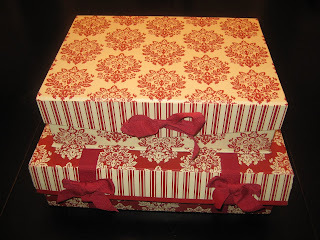 January 11, 2014 by Laurie 17 Comments This post may contain affiliate links, which means if you click on a link and purchase something, I may earn a small commission (at no additional cost to you.) See my disclosure policy HERE. January 10, 2014 by Laurie Leave a Comment This post may contain affiliate links, which means if you click on a link and purchase something, I may earn a small commission (at no additional cost to you.) See my disclosure policy HERE. This week (thanks to keeping up with Motivated Moms), I've been really working to keep up with my laundry, and oh my heavens, it feels so good to have that tiny bit of life just more put together. This, my friends, is my washer. And come right on over and meet my dryer. Do you see what's special about them? Clearly, they are not fancy, but they are ~ drum roll please ~ EMPTY!!! Here's the thing about laundry: you can put it off, you can hide it in your closet, you can hide it behind your door or stuff it in your hamper. But guess what? It doesn't go away, no matter what you do (well, until you do it), and whether you tackle it today or wash it all a week from now you still do the exact same amount of laundry. This is not one of those chores that helps a procrastinator out a single bit. Get caught up, completely. Even if it means beginning at 7 AM tomorrow morning and not finishing until Sunday night. Once it's done, join me and tackle a load a day (maybe more or less, depending on what season of life you're in! ), and let's really keep up with our laundry this month. Soooooo, anyone with me? Let's go! 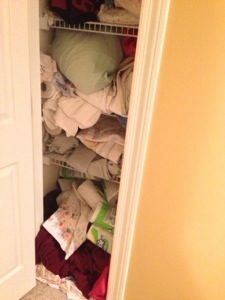 Note: if you're a working mom or have little ones at home, I know keeping up with the laundry is even a more monstrous task than I can imagine ~ even as a mom who works at home it is one of those things that's hard for me to keep on top of. I encourage you though to really (really!) try to get control of this one area of your world as I promise it will give you so much peace. But, in the midst of it, be sure to give yourself grace during this busy season of your life ~ we're definitely all at different places and I know some days the laundry is just too much! 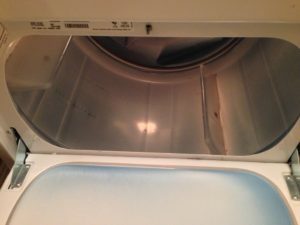 See how I learned to love doing laundry, my penny pinched (tiny!) laundry room, and my basic laundry routine. I'd love to hear your tips too! January 31, 2013 by Laurie Leave a Comment This post may contain affiliate links, which means if you click on a link and purchase something, I may earn a small commission (at no additional cost to you.) See my disclosure policy HERE. We spent about two hours working, and here's what we accomplished . . .
Find a friend to work with. It just makes life more fun, and you'll tackle those big projects more quickly! Shine your sink. 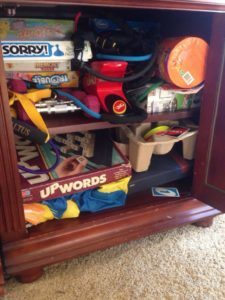 There are lots of great tips on organizing out there, but for me, this one seems to make all the difference in how organized our home stays. I'm convinced it motivates me to keep up with other things too! 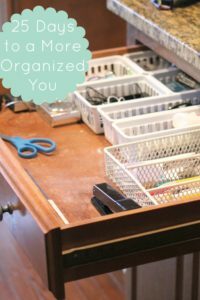 I'd love to hear if you've conquered a big project this month while organizing at home, and always love hearing your tips! Take a minute and share your thoughts by clicking HERE . . . and happy organizing! January 30, 2013 by Laurie 2 Comments This post may contain affiliate links, which means if you click on a link and purchase something, I may earn a small commission (at no additional cost to you.) See my disclosure policy HERE. 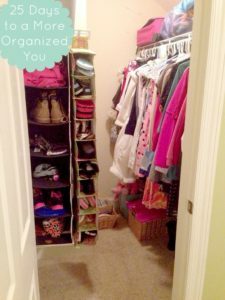 After sharing a ton of ways to organize here over the last month, today I'm going to share my absolute most-embarrassing post ever including pictures of my disastrous closet. Believe it or not, it's stayed *manageable* for two years since I initially posted this, although it could use a little fluffing! If you're looking for some motivation to get started on those big projects that just seem overwhelming, here you go. . . I realized recently as I looked at the daunting task of re-organizing my closet that there was no way I had the few hours of time it would take to accomplish such a monstrous challenge. So I started thinking . . . what if instead I set aside just 15 minutes each day to tackle the job? Now you need to understand, my closet was a disaster . . . completely unbelievable . . . we haven't cleaned it out in FIVE YEARS! And while I'm pretty good about keeping the rest of my house tidy (well, as tidy as three kids and a messy hubby allow), I had pretty much given up on even starting this mess! How To Organize The Tupperware Drawer? January 27, 2013 by Laurie 1 Comment This post may contain affiliate links, which means if you click on a link and purchase something, I may earn a small commission (at no additional cost to you.) See my disclosure policy HERE. 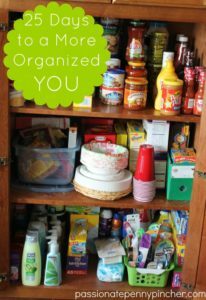 Today's organizing post is one that I shared last Spring on how to organize the tupperware drawer. 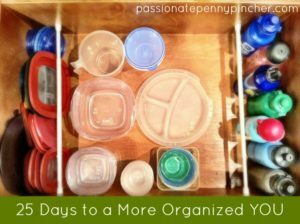 When Jennifer asked about how to organize the tupperware drawer over on the PPP Facebook page, I knew this was one we all struggle with! Hopefully it'll help you get yours under control also! 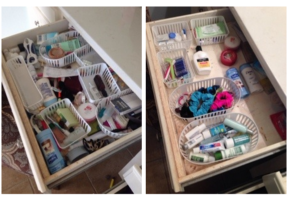 Do you know of any other clever ways to organize drawers in your kitchen? I'd love to hear them! January 26, 2013 by Laurie Leave a Comment This post may contain affiliate links, which means if you click on a link and purchase something, I may earn a small commission (at no additional cost to you.) See my disclosure policy HERE. January 25, 2013 by Laurie 2 Comments This post may contain affiliate links, which means if you click on a link and purchase something, I may earn a small commission (at no additional cost to you.) See my disclosure policy HERE. January 24, 2013 by Laurie Leave a Comment This post may contain affiliate links, which means if you click on a link and purchase something, I may earn a small commission (at no additional cost to you.) See my disclosure policy HERE. Can I just start by sharing that I have absolutely no business teaching anyone how to organize anything? 🙂 To say I'm mortified to share this picture is an understatement, but now that it's all cleaned up I'm hoping it'll motivate you to get your cupboards cleaned out too. This is the cabinet in our pantry where all the “extras” go, and I don't know that I've cleaned it out in at least a few years. Needless to say, it was time! I donated a ton of cookbooks . . . there are so many that I don't use at all, and it felt so good to get those cleared off the shelves. Like many folks I primarily hunt down recipes online, so the extra clutter isn't worth it except for the books I really do love. I did keep out a few favorites that I'd really like to use soon . . . Your turn now! 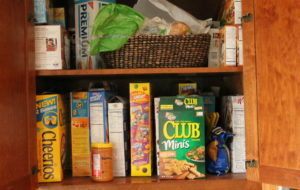 If your pantry needs it, determine to spend the next few days really getting it cleaned out. Take on bite-sized pieces each day, and I promise it’ll feel so good to have it all done. I can’t wait to hear how you do, and if you have any tips on cleaning out the pantry, I’d love for you to leave a comment to share! January 23, 2013 by Laurie Leave a Comment This post may contain affiliate links, which means if you click on a link and purchase something, I may earn a small commission (at no additional cost to you.) See my disclosure policy HERE. While our family really has always had enough, there were so many days prior to couponing when we had just enough. Because we've always tried to live within our means, there were many days when it was all I could do to stretch our grocery budget from paycheck to paycheck, but there really wasn't plenty. YIKES! Why on earth do I show this stuff with you all??? Your turn now! If your pantry needs it, determine to spend the next few days really getting it cleaned out. Take on bite-sized pieces each day, and I promise it'll feel so good to have it all done. I can't wait to hear how you do, and if you have any tips on cleaning out the pantry, I'd love for you to leave a comment to share! January 22, 2013 by Laurie 2 Comments This post may contain affiliate links, which means if you click on a link and purchase something, I may earn a small commission (at no additional cost to you.) See my disclosure policy HERE. If you frequently sign up for free coupons and samples, create a “penny pinching only” email account to sign up for those freebies. That way you can still get all the deals, but your regular inbox won't be inundated with emails that you may not be interested in. What other tips do you have for cleaning out your inbox? I'd love to hear them, so take a minute to comment and share! January 21, 2013 by Laurie 6 Comments This post may contain affiliate links, which means if you click on a link and purchase something, I may earn a small commission (at no additional cost to you.) See my disclosure policy HERE. 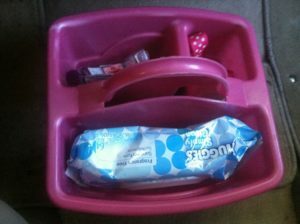 Our car's command center: includes baby wipes, hand sanitizer, band aids, and a few snacks in case of emergency while I haul my kiddos around town. Here's the before. . . So, take $6 and 30 minutes and get your car cleaned out too if it's not already. If you want to pinch a few extra pennies, at least vacuum it out at home . . . I promise you'll be so glad you did!